Hydraulic system works essentially on Hydraulic fluid. It is therefore necessary that the hydraulic liquid provided be of the quality that can sustain for years together. How do you get a sustainable hydraulic fluid? The foremost plan of action is the filtration technique. A high quality filtration process benefits the lifeblood of the fluid. Filters are rated hence. There are two most used ratings that create an impact on the cut-off point such as the absolute rating and the nominal rating. These ratings are known as micron ratings. It is imperative hence to choose the right quality of filter element so that the hydraulic systems work efficiently without a pause. For filter selection it is important that the choice may be done with regards to the pore size. The pore size rating measures the largest particle that can pass through the filter. This is the reason why absolute and nominal categories of pore size ratings are available for filters. What role do filter ratings play? The liquid often received from the earth’s crust contains oils, emulsions and any other hydraulic fluid that may not be necessary for hydro mechanical systems. It is the filtration process that aids in removing the contaminations. The filters ratings help actuate the hydraulic motor move by fluid under pressure. Filter ratings help to measure the effectiveness hence. The filter must hold ISO 4406 code to show the efficiency of the filter system. When a filter is ISO credited, it means it can help to prolong the life efficiency of the hydraulic system. There is a huge impact of nominal rating, which brings us to the arbitrary value for performance of a filter. Is nominal rating the right way to get the perfect rating? In a lay man’s language, nominal rating is to value the performance of a filter. It is determined by the manufacturers of filters. It is expressed in percentage retention depending upon the specified contaminant as per particulate weight. Under this rating procedure, the micro ratings become inconsistent. Often retention of the specified particular size is found to be of 90% to 98%. Nominal rating is usually disfavored due filtration test that the filter manufacturers undertake. Such tests lack uniformity and reproducibility. This is the reason why variations in this regards are found pretty much high. In a nutshell, nominal rating is nothing but the pore size rating. It refers to the filter’s capability of preventing passage of a minimum percentage of solid particles that is greater than the pore size. These sizes are denoted in micrometers or microns. The minimum percentage of solid fragments are usually somewhere in 60% to 90%. There are many elements that are taken into consideration while testing the filtration process such as the shape of the particles, the concentration of the particles, operating pressure etc. There makes sense as why manufacturers favor nominal rating over absolute rating. Absolute rating refers to the cut-off point where the filter is tested on to see if the largest solid particle can be retained from forgoing into the filter under low pressure and under non-pulsating conditions. 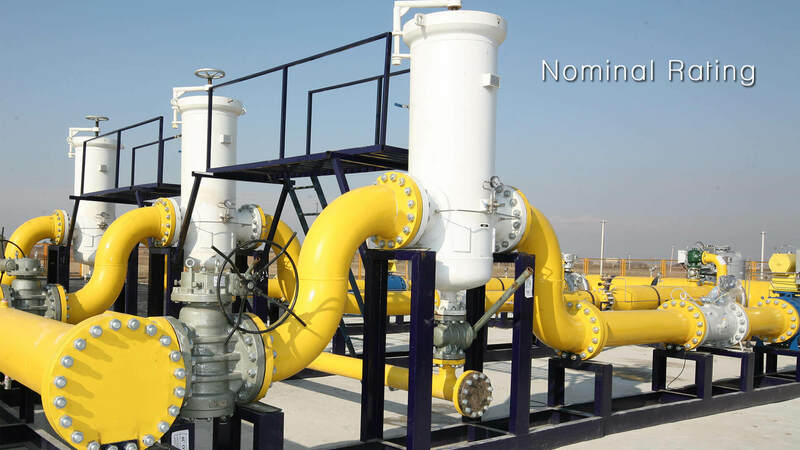 Nominal rating refers to the minimum percentage of solid weights that can be withheld in the filtration process. It means for instance an element of 30 m can easily pass 20-40% of particles of similar size. There are chances that it may hold a substantial amount of smaller particles. Whatever be the choice, manufacturers publish the efficiency of the micro-rating on nominal pore size rating. Nominal rating is the basic rating given for any filters. It is advisable hence to verify that the filter is also rated for absolute microns too. At the end of the day it is all about filter elements. They help big time to remove impurities from the liquid. Filter elements are vastly used in water treatment systems, fluid processing applications etc. It is therefore necessary to use a filter media that can actively separate solids form solution. The present hydraulic systems run at high pressure, this is one of the bases as why a system does become sensitive to contamination. It is therefore advisable to go in for a filter element that is as per ISO and fulfill the industrial needs.